Bright colours, washability and good fit are all important to us when producing printed tshirts hoodies and other clothing. Equally important to us is the provenence of the goods so we only use suppliers who subscribe to the Ethical Trading Initiative. With a reputation for quality and a portfolio of happy Guernsey clients our promotional team has an extensive range of products for any event, workplace or occasion. We offer a personalised design service and can print on to all kinds of materials including hoodies, t-shirts, trousers, coats, shirts, aprons, hats and bags. There are three main methods we use to print on clothing – which one we use depends on many factors but it is generally the material of the garment that is the decider. We use traditional vinyls like you’d find in other clothing printers, and we also have the options of dye sublimation and Direct to Garment (DTG). Vinyl printing is all about heat transfer. We use a machine to cut out letters and designs from coloured vinyl (or we print in colour onto white vinyl) and heat-press them onto the garment to transfer the image to it. 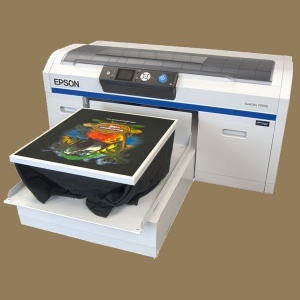 Vinyl printing depends on a combination of pressure and heat. Dye sublimation printing, is a printing method for transferring images onto a substrate (usually a cloth material such as polyester) and involves the use of a digital printer to produce mirrored images on paper that has been specially coated with a transfer material. When the heat is removed from the transfer paper and garment, the ink that has permeated the substrate fibres solidifies and is locked permanently into place. DTG uses inkjet printing technology to send a full colour detailed design directly from the computer to a digital printer with a garment loaded into it. You can expect a soft to touch finish with DTG printing, as the inks sit within the fabric rather than on top of it making this ideal for fashion and retail. When printing onto dark colours, as a result of the white base coat the print may be slightly raised.